Produced by Leo Leoni and Paul Lani. 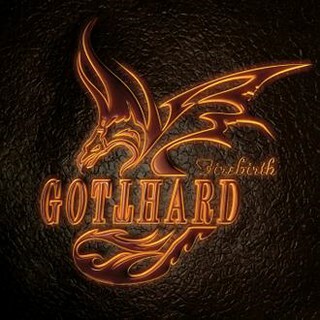 With Firebirth, Switzerland’s Gotthard have resurrected themselves and moved forward after the sad and untimely death of their lead singer and friend Steve Lee. New singer Nic Maedar, who does sound a little like his predecessor (but of course different), possesses a voice that seems to fit the band’s style like a glove. &nbspGotthard have always had a number of ingredients in their music — from heartfelt ballads, to rockers, to almost fun time pop-rock, and Firebirth has all of this in the mix. But ballad haters be warned, there are slow numbers aplenty here — with “Remember It’s Me”, “Shine”, “Take It All Back” and “Where Are You” outweighing the rockers — although with Gotthard you kind of expect a few power ballads. However, not being slouches in the musicianship and melodious departments, Gotthard don’t make these numbers seem like annoying and depressing wimpfests. In saying that, “Tell Me” is so tear jerkingly sappy that it’s almost bile inducing for me, but of course some might call it beautiful. &nbspAll is not lost for those of you that hate mushy numbers though — “Fight”, “Right On” (sounding like something from the band’s 1992 debut album), “S.O.S.” and “I Can” crank things up a few notches while “Yippe Aye Yay” (as the title suggests) is fun with a breezy nature, in a vein reminiscent of “Lift You Up”. The lead-off single “Starlight” is pure Gotthard as well, a song that Steve Lee would have been completely comfortable in recording. &nbspFirebirth isn’t a lost classic of an album, instead Gotthard have just honed in on their usual formula — nothing more, nothing less. There is a comforting type of sameness to this disc, with no dabbling in anything out of their norm, and I think Steve Lee would be proud of this effort. All in all, fans should be happy enough to put this in their cart.